As theCity of LA faces a budget shortfall of somewhere between $350 million and $500 million (depending on the day and the source), the Rec & Parks Commission (RAP) is preparing to act on RAP staff recommendations to shakedown the Community Gardens family for “budget dust” in a process that demonstrates all that is upside down about the budget process. One would think that in times of lean, the local community farmers would be supported as community assets, encouraged to teach others to turn fallow land into sources of healthy food, cultural intersections, and environmental tools for healthy communities, all run by volunteers. But instead, the RAP Commission meets tomorrow morning and will accept a staff recommendation to raise the plot fee for community gardens on RAP land by 380%. Prior discussions have focused on the notion of “cost recovery” but now the RAP staff propose to reward the volunteers by declaring the gardens “open space” and then placing three year term limits on each gardener. The notion of “cost recovery” is a Mayoral directive that sounded reasonable until it was discovered that in some cases the gardens weren’t on City of LA land, in some cases there was no cost, and in some cases the associated costs are for RAP staff that don’t actually service the gardens. The cloud of accountability at RAP prompted Commission President Barry Sanders to declare that he didn’t think the Department of Recreation and Parks should be in the business of managing gardens, a concept that resonated through the gardening community but not through the department. Now comes the staff report that includes enough cumbersome language and troubling clauses that it clearly demonstrates the need to put more gardeners in City Hall and fewer bureaucrats in the garden. There are dozens of community gardens throughout Los Angeles, typically established on fallow and abandoned land, now revitalized and repurposed by volunteer urban farmers. The gardens provide seniors and low income families healthy food while creating a positive environmental solution in densely populated neighborhoods. Some gardens have an educational focus, some have community space, and some focus on cultural pollination. 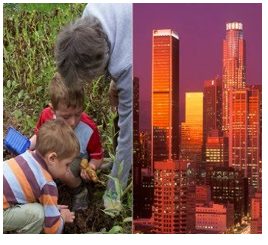 There are many hosts for the community gardens, ranging from the PORT of LA, the Bureau of Sanitation, the CA Department of Transportation, LA’s Department of Water & Power, the Army Corps of Engineers, and LA’s Department of Rec & Parks. In most cases the gardens are simply admired from a distance and appreciated as a huge improvement over the alternative of empty and blighted land that would require maintenance and supervision. But in the case of the gardens on Rec & Parks land, the department sees a “cost recovery” opportunity. • The increased fee is excessive, it will destroy long established community facilities, and it puts the welfare of RAP staff ahead of the welfare of the tax-paying public. • The increased fee is not only excessive, it fails to account for the financial contributions of the volunteer gardeners who pay for improvements and maintenance for land outside their garden. • The increased fee sets a bad precedent of charging volunteers who work to improve the quality of life in their community. Who next? Neighborhood Watch Groups? Emergency Preparedness Teams? Literacy Instructors? • The increased fee is a one-size-all solution that actually violates pre-existing land deeds and contracts, demonstrating the folly of a RAP proposal that seeks to standardize gardens to fit into their departmental structure. • The RAP staff proposal includes elements that have nothing to do with “cost recovery” but simply justify staff participation in the ongoing operation, consuming any potential revenue. • The RAP staff proposal recommends designating the gardens as “public space” which is a transparent staffing tactic that establishes a troubling precedent for land set aside for specific use. • The RAP staff proposal recommends term limits, demonstrating a callousness toward both the process of gardening and the time and labor needed to develop a fruitful garden, as well as to the disruptions of community which such a term limit clause would create. • The RAP staff proposal takes an interesting approach to moving forward, recommending the termination of agreements and permits as the beginning point of the development of “Partnership Agreements.” Cavalier at best, it fails to demonstrate a win-win approach to establishing long-term positive relationships. Community Gardeners from around the Los Angeles will be fighting for the gardens operated on land controlled by LA’s Department of Rec and Parks. The general position of the gardening community is simple; drop the open space and term limit proposals, build partnerships before terminating relationships, and implement “cost recovery” with real data, not inflated staffing justifications. The battle over community gardens is simply the beginning and the results will resonate through the Department of Rec and Parks and the City, laying down a foundation of “cost recovery” strategies that will have an impact throughout Los Angeles. CityWatchLA - Paper or Plastic?